On Friday, it was reported that U.S. gross domestic product (GDP) for the fourth quarter increased by 2.8% from last year. This was a downward adjustment from the government’s prior projection of 3.2% growth. The downward revision was attributed to weaker state and local government spending where budget cutting is needed. The University of Michigan/Thomson Reuters survey of consumer sentiment hit a three-year high this month of 77.5. Additionally, the U.S. Federal Reserve recently improved its 2011 economic forecast for 3.4 to 3.9% growth (the previous range was 3.0 to 3.6%). MY TAKE: Economic forecasting is a tough business. Headwinds to the current forecast include U.S. federal, state and local government spending cuts, further challenges in the housing market, heightened oil prices, persistent unemployment, higher food prices, and uncertainty in emerging economies. Where is Political Change in the Middle East and North Africa taking us? A week ago, Egyptian President Hosni Mubarak stepped down and the region's dynamics continue to change. Iranian naval ships are seeking passage through the Suez Canal. Violence has broken out in Bahrain - which is home to the U.S. Navy's presence in the Persian Gulf. Protestors in Yemen are demanding the resignation of President Ali Abdullah Saleh, in office for the last 32 years. In Jordan, activists are seeking political reforms. In Libya, where Muammar Quaddafi has been in power since a 1969 military coup, protesters are clashing with the government. MY TAKE: The complexities of the region influence many global dynamics. Drivers of the current unrest include high unemployment, food shortages, corrupt leaders and repressive political systems. 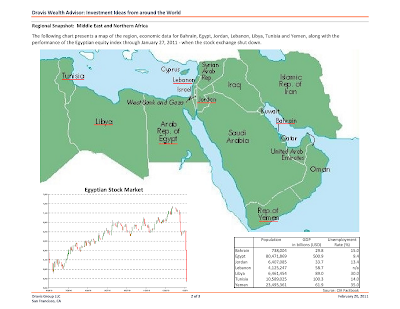 While there are many factors for investors to consider, a test of regional economic stability will be the reopening of its banks and the Egyptian Stock Exchange - that remains closed since January 27. Hosni Mubarak has stepped down as president, and weeks of demonstration by protestors are subsiding. However, as the military takes over many questions remain. MY TAKE: The action over the past few days is a historic victory by the Egyptian people. The challenges ahead include how the transitional government will evolve and how the issues of significant poverty and high unemployment are managed. My daughter and several of her schoolmates had planned to travel to Israel and Egypt this coming week. Recent events now will limit the trip to Israel. I look forward to her insights about the region when she returns. MY TAKE: In an increasingly interconnected global economy, trends such as inflation are likely to be shared in one way or another by most market participants. While the Federal Reserve and some economists may discuss inflation in terms that often excludes the impact of food and energy costs, if people feel like there is inflation, they will likely behave as if there is inflation. As many events in the past few years have demonstrated – perception is a significant factor in shaping reality.